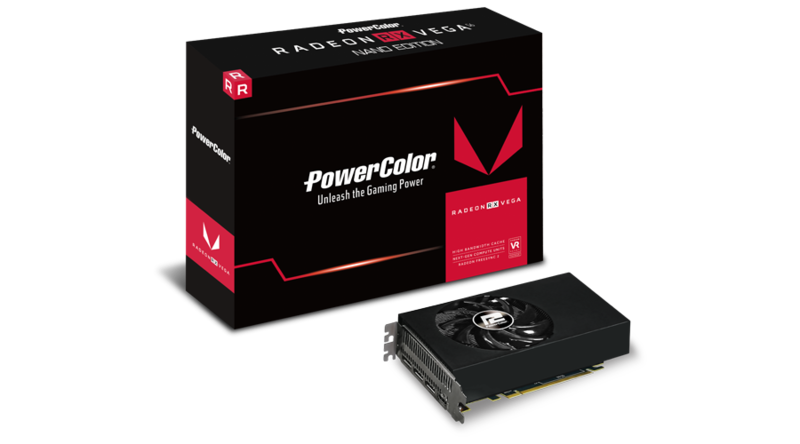 PowerColor has taken the Vega branding and design a step further with the launching of the RX Vega 56 Nano edition card. The Vega 56 Nano is not an original reference design by AMD, but rather a PowerColor original taking notes from the R9 Fury Nano. As you can tell by the name, the chip used for this Nano edition is the Vega 10 with reduced cores and carries a slightly reduced core and memory clock speed. The card is powered by a 6-pin + 8-pin PCIe power connector and should be on-par with other Vega 56 full sized cards until thermals reduce boost speeds. With the addition of this new Nano, mITX builders and fans will be able to enjoy FreeSync and the full power of Vega 56 in a tiny package. Keep in mind, the new generation of graphics cards have dynamic clocks depending on power and thermals.